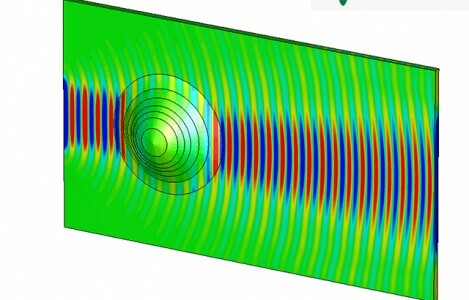 EECS Researchers worked with UK industry to demonstrate for the first time a practical cloaking device that allows curved surfaces to appear flat to electromagnetic waves. EECS’ Co-author, Professor Yang Hao, said: “The design is based upon transformation optics, a concept behind the idea of the invisibility cloak. The picture on top shows the cloak not in use (a uniform dielectric permittivity distribution along the surface): the presence of the object along the path of the traveling wave, drastically changes its electric field configuration. On the bottom, where the cloak is in action and the graded-index nanocomposite has been applied, there is a reduction in the amount of shadowing seen immediately after the object, as well as a noticeable improvement in the reconstruction of wave fronts. The underlying design approach has much wider applications, ranging from microwave to optics for the control of any kind of electromagnetic surface waves. The research is funded by an EPSRC programme grant – QUEST (The quest for ultimate electromagnetics using spatial transformations) and published in the journal Scientific Reports. ‘Surface Wave Cloak from Graded Refractive Index Nanocomposites’ by L. La Spada, T. M. McManus, A. Dyke, S. Haq, L. Zhang, Q. Cheng and Y. Hao will be published in the journal Scientific Reports on Friday 15 July 2016. Find out more about EECS research.